Ture wireless gets rid of constraint of wire. Multifunction button fuction to answer or hangup phone calls, control music, adjust volume and switch songs by presssing the button. 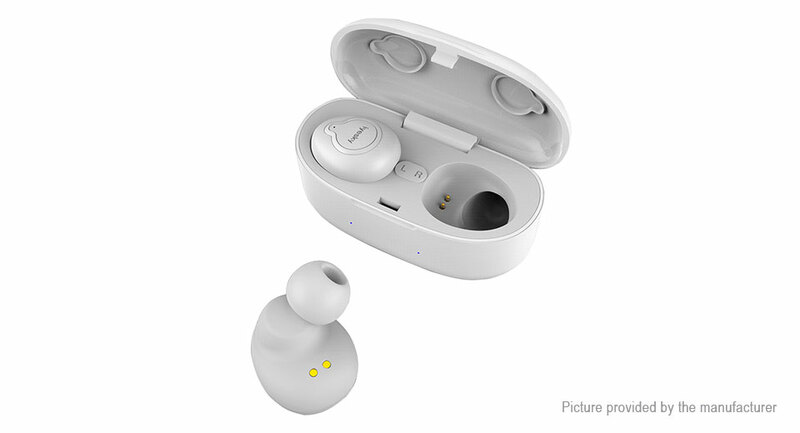 It comes with 550mAh charging dock giving external power bank for earbuds without worrying about died battery even hang out for a long time. With Bluetooth V4.2 chip the latest Bluetooth technology featureing fast and auto pairing, low consumption and further transmission distance up to 10 meters. It&apos;s pretty light only 10g which take off pressure from ear by improving it&apos;s shape and material with dozens of tests making wearer feeling comfortable and painless even in hours of wearing. With&apos;s waterproof rating of IPX4, wears can enjoy music in swimming pool but please make sure do not submerge into the water.